Apple just announced that first weekend sales for the iPhone 5C/5S hit 9 million, setting a new record. These figures were much higher than my expectations and suggest that Apple's fiscal Q4 may be much stronger than expected. While this year's numbers include T-Mobile, NTT DoCoMo and Chinese carriers, the fact that there were no pre-orders for the iPhone 5S makes the year-over-year comparison valid. By this measure YoY weekend sales grew by ~28%. Apple also told investors to expect fiscal Q4 revenue and gross margin to come in at the high-end of their forecasted range. Since the iPhone has consistently been Apple's most valuable product in terms of gross margins and volumes, this shouldn't come as much of a surprise. 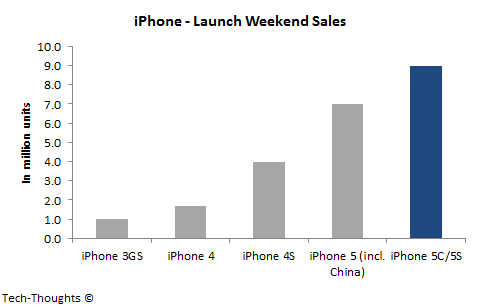 Strong demand for the iPhone 5S should also help shore up ASP for the quarter. Over the next few months, the sales mix is likely to shift in favor of the iPhone 5C. However, the base price of the iPhone 5C ($549) isn't that much lower than the current ASP ($581). Therefore, I wouldn't expect overall ASP levels to decline significantly from here.